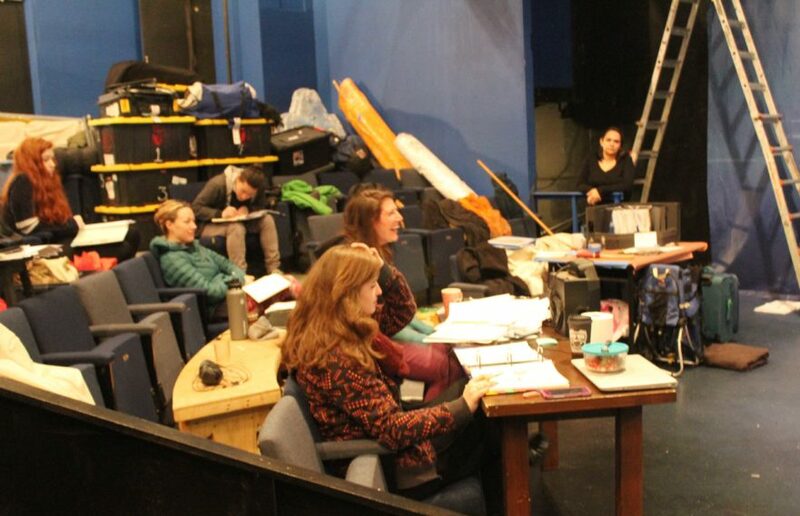 A daughter of the Arctic confronts her destiny in Whale Song, a world-premiere play by Cathy Tagnak Rexford (Iñupiaq), performing Feb. 1-23 at Perseverance Theatre, Alaska’s professional regional theatre company. The production, directed by Madeline Sayet (Mohegan), also performs March 8-17 at the Alaska Center for Performing Arts in Anchorage. Soon after a baby is born in a small Arctic village, her parents learn of a prophecy: In order to restore nature’s delicate balance, Ani will spend her girlhood training for the honor of someday marrying a bowhead whale, leaving humanity and spending the rest of her life with her new mate. Ani wants to do the right thing and fulfill her duty, but as a young adult, she has other loves and other plans for herself. Cataclysmic events in the waters around her, and some difficult discoveries on land, eventually force a choice. In addition to Tripp, the cast of Whale Song includes Jennifer Bobiwash, Frank Katasse, Evan Rothfeld, Erika Stone, Jane Lind, Todd Hunter, Tai Yen Kim, Ty Yamaoka, and Ashleigh Watt. The creative team includes Asa Benally (costumes), Akiko Nishijima Rotch (scenic design), Art Rotch (lighting design), Rory Stitt (sound design), and Hali Duran (choreography). “I love collaboration, and Whale Song is the kind of piece that truly requires a solid team to bring its realities into existence,” says director Madeline Sayet, who worked with Rexford and other Perseverance artists on an earlier draft of the piece in 2017. “Many of the climactic moments in the play are hugely complex stage directions, illustrating what needs to be advanced in the story—but not how to do it. We needed to figure out through movement how to stage complex philosophical notions… Luckily our choreographer, Hali Duran, is brilliant, and has made transforming into a whale seem more and more straightforward every day. Whale Song continues Perseverance’s landmark 40th anniversary season, which began this fall with Thornton Wilder’s iconic play Our Town and the world-premiere play Franklin, by Samantha Noble. Still to come are the musical Guys and Dolls, by Frank Loesser, Joe Swerling and Abe Burrows (playing March 15-April 13 in Juneau, May 3-12 in Anchorage); and Steve Martin’s bawdy comedy The Underpants (playing May 17-June 16 in Juneau). In addition, Juneau will enjoy the Young Company production Disco Alice: The Wonderland Remix, adapted and directed by William Conrow and playing the first two weekends in March. Please refer to our website, www.ptalaska.org, for show descriptions, ticket prices, and other details. “Pick Three” subscriptions for both cities’ season remaining lineups are still available at www.ptalaska.org or by calling 907-463-TIXS (8497). For single tickets in Anchorage, please visit www.Centertix.com or call 907-263-ARTS (2787).